Quite simply, Gay.com is a premier gay dating site. And while some platforms for gay singles appear to be aimed primarily at hook-ups, this is a site which caters for everyone. Whether you are looking to just have fun or find the partner of your dreams, there are numerous features and tools to help you. And with so many members, it is no wonder that Gay.com is more of a social network or community than a simple dating site. The site has been designed so that it is not only easy to use, but also possible for you to tailor to your own specifications. And all of this for an extremely impressive cost-effective price. There are so many gay.com site features both big and small, which help make this an excellent production. For a start, the “Local Scene” area of the site is a very useful directory of venues and events in your area. Meanwhile, the entire “Lifestyle” tab presents you with all the latest gay news and articles of interest. As any Gay.com review will surely emphasize, with these tools you will begin to see why this is more than just a dating site. But when it comes to finding someone, Gay.com also provides some great features to make the process as smooth as possible. For example, search results include a summary of each profile, which means that you can learn a whole lot more about other users at a glance. The site also puts you in control, as you can determine exactly who sees which pictures. You should have no security qualms about using the site. Personal information is protected by the site administrators. In addition, you have the ability to block users you do not wish to communicate with and can also “mute” users who you think may be suspicious. For a start, the sign up process really is very straightforward and so you should be browsing users in no time. There are essentially 3 stages to complete. First is simply a question of entering a username, e-mail address and date of birth. The second section is more personal and requires you to enter details such as height, weight and physical appearance including tattoos. However, the third and final phase is perhaps the most critical and goes a long way to helping people find you. 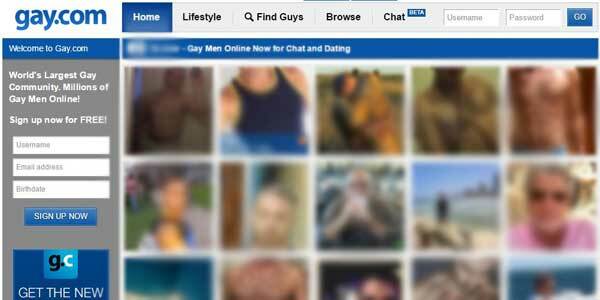 In addition to uploading a photo and composing a self-description, you will be asked to enter the kind of physical and sexual preferences that you won’t find at a generic dating site with gay members, such as Zoosk.com. The result though is a really detailed profile which can only help you find exactly who you are looking for. There is nothing difficult about using the gay.com dating site. The site is not only aesthetically attractive, but it is also extremely logical. It means that the dashboard places you just a click away from pretty much everything you might need. So, tabs on the top of the page take you directly to “Find Guys, the “Lifestyle” section and the chance to “Chat” with users you are interested in. The sidebar gives you access to your own profile. Meanwhile, a selection of potential matches takes up much of the screen and conveniently “pop out” one on one chats are available without you even needing to exit the dashboard. You can also enjoy all the gay.com site features wherever you are thanks to a mobile app compatible with Android and iPhone. There are two different types of search that you can conduct. If you are looking for speedy results to get a general idea of who is in your catchment area, then try a quick search which allows you to look for someone via gender, age range and location. However, if you are looking for something more specific then the custom search is extensive and includes many of the fields found in the sign up process. They include the kind of details that you will find on any generic dating site. But it also includes lifestyle criteria, physical attributes and sexual preferences. With the possibility of a keyword search too, you can find exactly what you want and then save your favorite searches for convenience. You can become a free member and in fact you will find that the benefits of free membership are very generous, even compared to other top gay dating sites like CompatiblePartners.com. You can upload photos, use the chat and e-mail facility while also joining the online communities. However, the amount of browsing you are entitled to do is limited. For the full benefits of the site, you will need to pay. 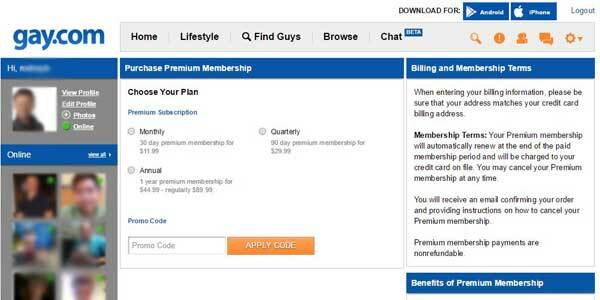 A single month costs $11.99, the 90-day plan will set you back $29.99 while becoming a premium member for a year is $44.99. Well, the name is a bit of a giveaway! This is unquestionably a site devoted to letting gay singles find a date or someone special. And this is where gay.com differs from other gay dating sites such as Manplay.com which are focused on hooking up and casual fun. Gay.com caters for all gay singles, whether you are looking for a fling or the love of your life. The detailed sign-up details and exhaustive search facilities help make sure that the site caters for everyone. The only conclusion for any Gay.com review is that this is a winner for gay daters of all descriptions. It is a slick production with plenty of engaging features. And with around 4million users and an excellent search tool, there is every chance of finding what you’re looking for.